How do you boost self-esteem in adults? Low self-confidence is something many of us walk around with and it affects our day to day lives. It’s coming from our childhood but luckily you can improve your self-esteem little by little by following these self-confidence tips and doing our self-esteem exercises. The amount of self-confidence we have as adults is usually formed from our experiences as a child. Self-confidence and self-esteem are tied into our frame of reference for our world. When we are small and make a mistake, like spilling a glass of milk all over the table, our first instinct is to look at our parent’s faces. Their expression tells us first and foremost how this little accident is going to be perceived. Next, the tone of voice that one or both our parents’ use gives our subconscious mind a reference that is stored. “Oh my God, you always do that!” can be layered one on top of another thought in our minds, so that eventually, we believe that our mistakes are predestined and that there is little that we can do to prevent it. Our parents, friends and teachers, have a way of presenting and saying things that we eventually store and our brains come to one conclusion. At some point, we decide without really knowing it, that we are not good enough. When we want to try something new, like ask someone out on a date for the first time, we may logically believe that we have a chance but the little voice in the back of our head, is telling us that we shouldn’t even try because we aren’t good enough for that person we desire to be with. We have low self-confidence is some areas but are we totally unconfident? If you think about it the answer would have to be no, you have lots of confidence, somewhere. You may have developed a great deal of confidence in hitting a baseball or throwing a football. In school, You may have had a great ability to do math or maybe you’re able to land deals at work or submit amazing finished projects. In reality, there are many things that we are confident about. It is the small number of things that give us trouble or concern, that causes us to label ourselves as having low self-estee. The best time to rid yourself of that feeling is the moment that you discover you have it. In order to act on a fear that is making you unconfident, you have to understand that you will not die from picking up the phone and making a call that has to be made. There will be no physical injury from going across the room and talking to that person who is very desirable to you. Act as if you are confident. Walk and talk as if you have the same amount of confidence as your favorite athlete, actress or other role models. Low self-confidence can hold you back from getting the job you desire or the mate that you want so much and would marry if possible. Allowing incidents of low self-esteem to stack in your brain, like a pile of dinner plates in a feeble cupboard, will eventually cause all those plates to tear that cupboard down. 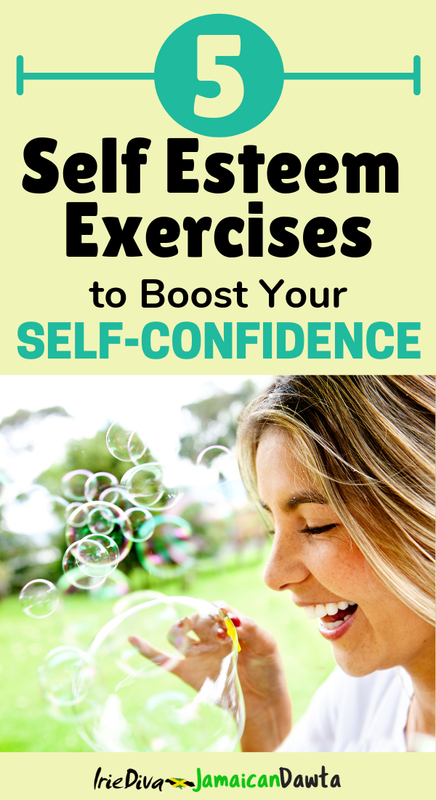 In order to stop the cycle when you have your own children, these self-esteem exercises will help to boost your own self-confidence and prevent a reoccurrence. Children are the world’s best mimics. They see that you are afraid to talk on the phone and they suddenly become phone phobic. They internalize arguments between their parents and carry around trust issues and low self-esteem developed by observing the adults in their lives. There are many great books and courses on learning how to build self-esteem in adults. This is a favourite of mine. 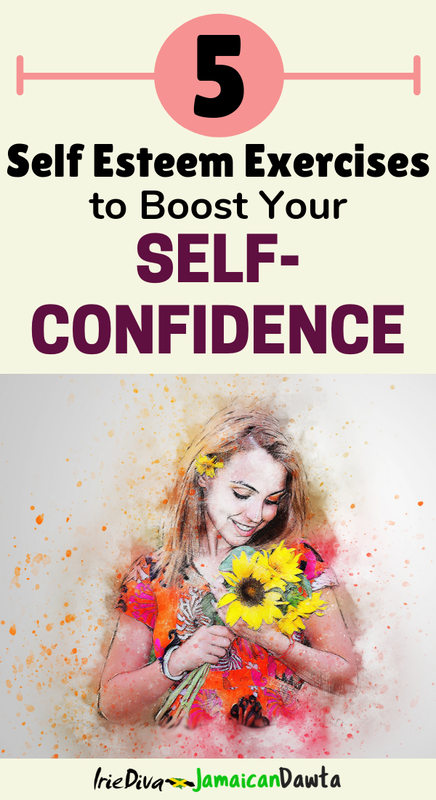 It will help you to develop your self-confidence so that you can live your best life, slay your goals and will know how to not pass on these issues to your children. Self-confidence is a daily practice. You need to exercise that confident feeling to keep it strong and flexible. Let’s look at some ways that you can apply to your life right now to overcome low self-esteem. Eliminating negative self-talk is huge in the daily practice of self- confidence. You need to monitor what negative self-talk you have and when you have it. Be very mindful of how you speak to yourself. Having a journal based on your self-talk will allow you to write out what you are saying and why. You can review your bad habit and change it to a good habit. For instance, if you watch carefully and you notice that every time you are in a staff meeting, you get anxious because you know that your opinion will be consulted, take note of what you are saying to yourself to cause this feeling. When you sit in the meeting and find yourself hoping that they will skip over you and that you don’t want to speak because your ideas are not worthy, write that down. Then write down all the reasons why your ideas are worthy. Pretend that you are in the meeting alone and starting to speak. Would you hesitate? Of course not. You would present the ideas to the best of your ability. Hit the ground running when you wake up. How do you do this? Simply by not allowing your mind to play negative movies over and over in your mind, while you sleep. You often dream about the last thoughts that you had before you drifted off to deep sleep. When you wake, you may not understand that uncomfortable dream you had. However, the negative thoughts that you had, are layered into the dream and take on other roles. To prepare your mind for positive dreams, leading to a positive awakening, state a new belief about yourself over and over until you drift off to sleep. These beliefs are called affirmations and help to reprogram the subconscious mind. Repeat this nightly and when you wake up. The next meeting you have, you will feel energetic and excited about sharing ideas that will help the growth of your company. Be compassionate with yourself. Treat yourself as you would treat a friend you have had since childhood. When things don’t go as planned, don’t beat yourself up. Instead, encourage yourself and tell the inner you, that next time things are going to be gold. We all have moments of so-called failure. If we choose to learn from these moments, we grow. If we choose to be demeaning to ourselves, we wither. Even the best of the best in athletics have times when things don’t work out for them. Look at Tiger Woods for a great example. He was at the very top of his game, but his health and other things lead him to fall from number 1 in golf to lower than 200 in the world. He could have said to himself that he was a failure. But Tiger Woods has a winning mindset. For every setback, he works twice as hard to excel. If you could look inside Tiger Woods mind, you would see a strong focused mind, with a lot of self-confidence. Tiger knows he can be number 1 in the world of golf again. Same for Usain Bolt who ended his athletic career less than the golden status we’re all accustomed to from him. He’s still a winner and so are you when you choose to learn from your failures instead of wallowing in them. Practice daily visualization of the “new” you. When you wake in the morning, take a moment to see yourself as a more confident person. How would you move throughout your day if you were more confident? What would you wear? How would you speak? How would you act? In this, you are not acting, but actually seeing yourself in your mind, becoming what you desire, day by day until it fully ingrained in your mind and body. Slowly that visualization will start to morph into your reality. Don’t be upset with yourself, if you find that becoming a self-confident person is not a walk in the park. There is no harm in getting some assistance to become who you want to be. This can be in the form of therapy, talking to friends, seeking a mentor, taking courses or reading more books on self-confidence and self-esteem. There are courses that are specifically designed to help you get over any hurdles that block your way. Here’s one specific to helping you to have better conversations and overcome social anxiety. You can become self-confident today but you do need to take action first. Without any action, there isn’t any moving forward. Instead, you stay in neutral or unfortunately slide into reverse, becoming depressed and extremely anxious. Nobody wants that. Join me on Instagram for your daily dose of happiness, self-confidence tips and motivation to live your best life.